The DMM Flight is a highly featured sport climbing crag sack, combining a rope bag and rucksack. Sized to cope with everything you could possibly need for a day at the crag, the Flight even has room for a Euro style 80m rope. It matches the maximum ‘carry on’ hand luggage size for most airlines, and has stash-able features to reduce snagging during transit. The internal racking, tarp and pockets allow you to keep all your kit neatly organised and easily accessed. The perfect size: At 45 litres the Flight is specifically sized for sport climbing. It is big enough to carry everything you will need for a day spent clipping bolts. And when we say ‘everything’, we mean a full rack of quickdraws, a harness, rock shoes, food, water, chalk bag, guidebook, extra clothing and any rope length up to 80m. 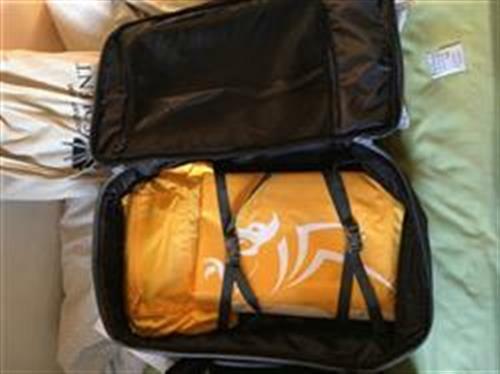 It also matches the maximum ‘carry on’ size for airline hand luggage and has stash-able features to reduce snagging during transit. Quick and easy access: The suitcase style opening has a heavy duty YKK 2 way zip – this gives you quick and easy access to all of your kit, regardless of where it is stashed in the sack. The foam side panels protect the contents from impact during transit, but they also give shape to the sack. When it is open the sidewalls stay rigid, making it easier to pack and unload. Keep your kit and valuables well organised: There are a number of useful features designed to keep your kit and valuables well organised. There is a deep, padded pocket for all the climbing day essentials. This is also sized to fit a Tablet or Ipad and is easily accessed from an external zip at the top of the sack. For extra security, there is an internal passport/valuables pocket with a key clip, which is only accessible via the main zip opening. For your climbing kit there is a quickdraw rack, a removable DMM rope tarp and compression straps to keep it all secure and stable. The tarp can be rolled up and secured separately which makes it ideal to drop into a Void for the journeying part of the trip. On the outside of the sack there is an adjustable shield for holding extra items such as a belay jacket or helmet. There are also external rope/clothing straps on top if you need to carry extra kit – both the shield and the straps can be stashed away when not in use. Another useful feature is that the 2 way zips allow a clip stick to be carried periscope style out of the sack. A comfortable and easy carry: There are three grab handles. There’s one on top and two on either side of the panel zip for a quick ‘gathering’ pick up when moving to an adjacent route. The handles are soft grip with a nice skin friendly feel – just a little feature that helps after a full day of ragging your skin on rough limestone pockets! It has a quick-drying Flow Airmesh back system with contoured and supportive padded shoulder straps, plus waist belt – all of which makes for a very comfortable carry. There is also a water bottle sleeve on the side of the sack – just to make sure that you stay hydrated at all times! Light but hardwearing: Light but hardwearing materials have been used throughout the construction of the Flight. And just to make sure, there are reinforced wear areas around the lid and base of the sack. I use the bag as carry on luggage (as well as the 45 Litre one) as when travelling I have short connection times. Great quality, excellent materials and holds a lot of equipment. Recommended. On a trip to Kalymnos via Athens I found the DMM Flight Bag very useful both for the flight and for 2 weeks climbing.It did take me some time to find the best way of packing it. This bag literally changed my whole travel and climbing experience! I had no issue and delay in getting out my kit of my bag, plenty of room for extra layers in the bag as well. Through the airport security I had a situation where I was asked to remove all electronics from my bag. I tend to scatter these around my bag so usually this would be my biggest nightmare, but because the bag opens up like a suitcase, I had no problem removing and placing back all the items! 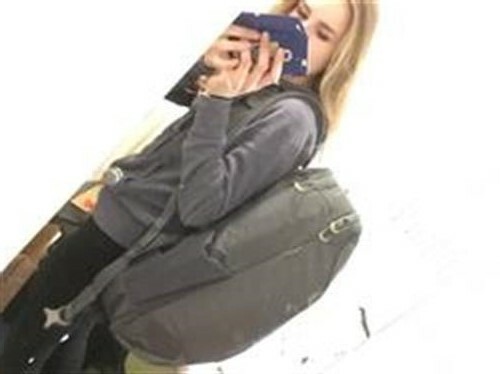 Completely stress free travel :) If you are looking for a bag for either climbing, or just hand luggage (especially if you are planning to just take hand luggage on a holiday) this is the bag for you! It's amazing and so worth the money! excellent backpack. Used it for climbing trips to Spain and also city breaks too. Storage for climbing gear is excellent with plenty of room for clothes for a week too. Only down side is that some of the plastic on the zip pullers has come off, it doesn't effect the use of the zips but a small manufacturing fault. Overall a great bag for both climbing and regular use.